The four valleys that make Bumthang is the sacred heart of the country. Besides natural beauty the valley is bountifully blessed with numerous ancient temples and is the revered birthplace of many saints. It was here that the legendary saint Pema Lingpa was born, to whom the Bhutanese Royalties trace their lineage. Bumthang is also distinguished in history as the first place in Bhutan where Guru Rimpoche brought Buddhism. This is the other temple built by Tibetan King, Songtsen Gampo. It was here that Guru Rimpoche conducted the first sermon on Tantric Buddhism for his host King Sendha, the local ruler, his family and subjects. The alcove above the entrance to the inner temple where Guru Rimpoche sat during the sermon can be still seen to this day. 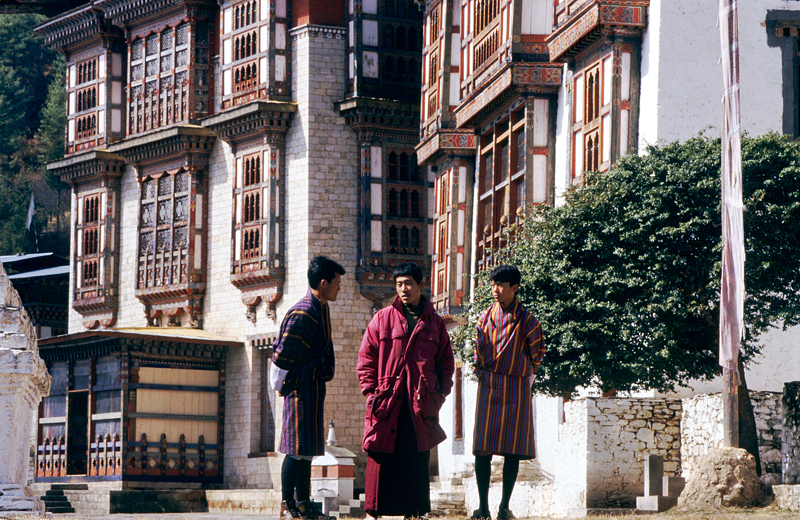 The then governor of Bumthang carried out the last known major renovation in 1905. The temple hosts a spectacular festival every year in autumn. One of the main attractions is a fire dance and the fertility blessings for women. Short distance from Jambey Lhakhang is the expansive complex of Kurjey Lhakhang. It consists of three temples. The one on the right was built in 1652 on the rock face where Guru meditated in the 8th century. The body imprint of the great master can be distinctly seen in the rock cave enshrined in the temple. Second temple was built in 1900 by the first king when he was still the governor of Trongsa. The third temple was built in 1990 by Ashi Kesang, the Queen Mother. A wall of 108 chortens surrounds the entire complex. Located in a village across the river from Kurjey Lhakhang is the seat of Bumthang’s famous saint-son Pema Lingpa. He built it himself in 1501. A skilled tantric master and an artist he sculpted the main statues and painted the frescoes, which can be seen even today, mostly in original state. There is also a chain mail made by Pema Lingpa that devotees carry and circumambulate the inner sanctum. The throne from which he performed the consecration ceremony is preserved in a small temple outside the main hall. The physical structure surrounding the main inner temple was restored at the end of the 19th century. Pema Lingpa’s expansive skills in building, painting, sculpture and metal work can still be seen in mostly original state. Tantric Buddhists believe in the tradition of treasure finders or terton. Treasures are various forms of relics hidden by Guru Rimpoche to be discovered by the future generation to aid religion in times of degenerate age or changing times. Pema Lingpa is the first of five main tertons. He is also revered as the incarnation of Guru Rimpoche himself. Founded by the great-grandfather of the first Shabdrung, the Dzong was initially a small hermitage in 1549. It was expanded the Shabdrung 1646 to help consolidate his expanding power into the eastern region. Scouting for a place for the dzong a small white bird was seen perched on a hill, which was taken as an auspicious sign, and hence the name Jakar, meaning white bird. As others, the Dzong is now the seat of district administration and monastic body of Bumthang valleys. A half an hour by car and then another on foot north of Kurjey Lhakhang is Thangbi Goemba, founded in 1470 by Shamar Rimpoche. One temple has deities in wrathful manifestations and the other has three Buddhas representing past, present and future. On the upper floor, the vestibule contains two remarkable paintings of Guru Rimpoche’s paradise and the heaven of Buddha Amitabha. This temple is a few hours walk from Thangbi Goemba in the small region of Ngang Yul. Guru Rimpoche visited the site and temple itself dates back to the 15th century. A Lama Namkha Samdrup, a contemporary of Pema Lingpa, built the temple. A three days festival is held here each winter with masked dances in honor of the founder. This place is about twenty minutes drive eastwards from the town of Bumthang. This is the site from which Terton Pema Lingpa discovered his first religious treasures. A wooden bridge spans across the trapped river-water pool. A story has it that Pema Lingpa on a later venture into the pool carried a burning butter lamp saying if he were a apparition of evil the lamp will be snuffed out and if not it will continue to burn on his resurfacing from the water. He dived into the pool and returned with more treasures and the lamp still burning. Since then the place came to be known as Membartsho or the burning lake. Even to this day pilgrims light lamps and release into the pool. Ura is 48 km, about one and a half hour drive, from Jakar. The road to Ura climbs through conifers and beautiful landscape. Farms and sheep pastures line the road. From the Shelthang La pass (3,600m) with a magnificent view of Mount Gangkhar Puensum (7540m), the highest unclimbed mountain in the world, you descend into the village. Ura has about forty clustered houses, typical to only few communities in Bhutan. The village has a new temple dedicated to Guru Rimpoche where the annual Ura festival is held in late spring. It has a huge statue of Guru Rimpoche and beautiful frescoes.